Sundance 1 RV Resort has a wide variety of homes for sale. The listings below are current for the start of 2018 / 2019 season. And we’ll be updating as new homes come up for sale and current homes are sold. So make sure to bookmark this page and check in regularly. 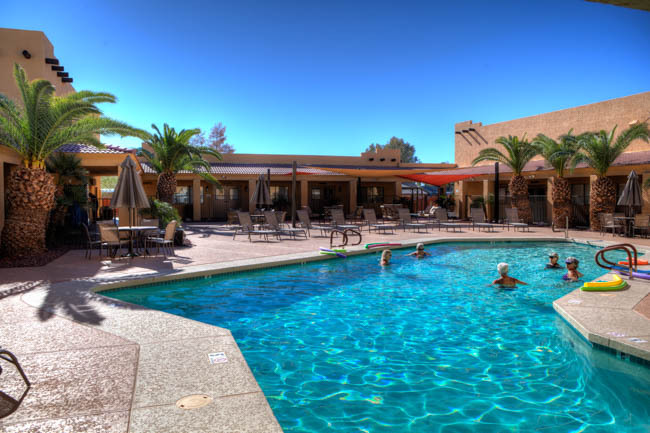 We’ve got an amazing resort community here in Casa Grande Arizona, and we’d love for you to become part of our community! 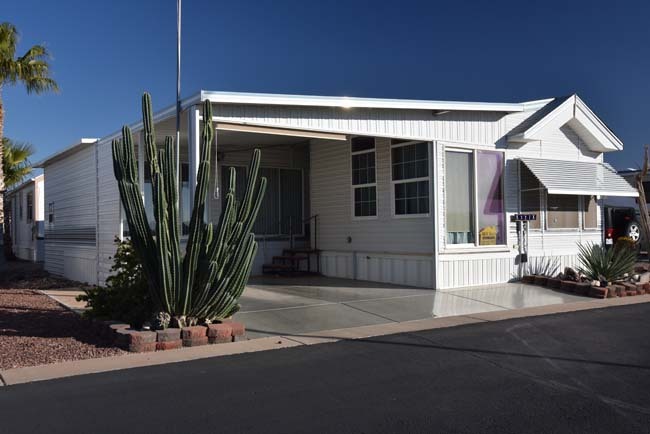 SITE NUMBER 149 - RV RESORT LIVING CASA GRANDE AZ - SOLD! 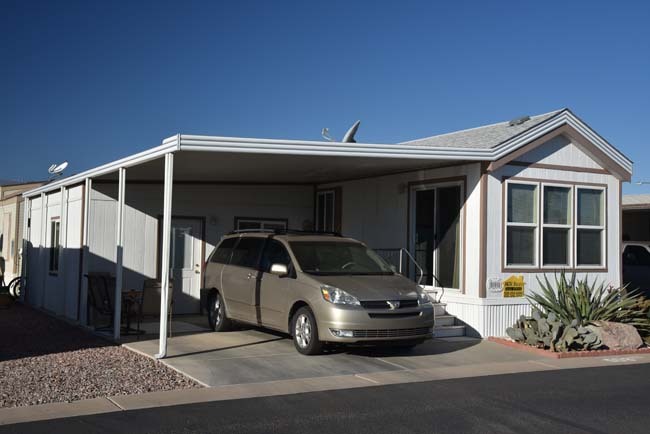 SITE NUMBER 27 - CASA GRANDE RV RESORT HOME FOR SALE - SOLD! SITE NUMBER 401 - CASA GRANDE 55+ RESORT HOME FOR SALE - SOLD! 2010 CAVCO, Site #207: Leading into this home is a deck that is approx. 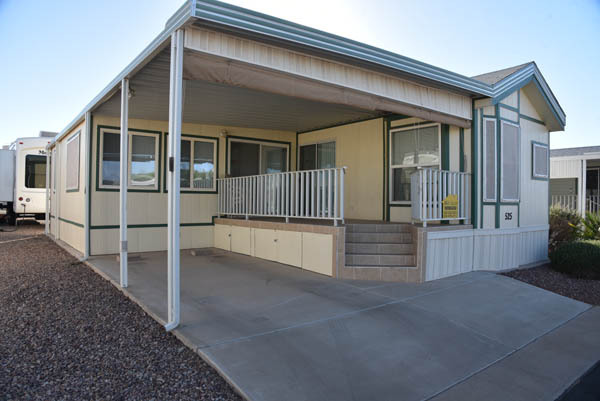 7 1/2′ X 18′ with ceramic tile floor, you can enter the AZ room or the Park Model from the deck. The living is roomy, beautiful cabinetry throughout, the angled wide galley kitchen has a large pantry & soffit lighting. The bathroom is larger with an angled counter top and tub/shower combo. The bedroom has a lift bed, his/her closets, built-in cabinets with tv cabinet, overhead cabinetry PLUS the bay has additional cabinetry!!!! The AZ room is approx. 11′ X 17′ with a unique landing area with additional storage. The util. room (approx. 8′ X 14′) has a washer/dryer, water softener and additional cabinetry for even more storage! THIS HOME IS INCREDIBLY ENERGY EFFICIENT. There is additional concrete to the side/rear of the util. room. Furnishings included. There is an assumable termite contract on this home. This home is immaculate and ready to move into! Priced at $64,900.00 to view, call Steve or Wayne at 520-876-2699 or Steve cell at 520-252-5202 or Wayne cell at 616-690-6929. 2009 LAUREL CREEK, Site #227: This immaculate, energy efficient home has an open angled wide galley kitchen with oak cabinetry, bull nose tile, built in microwave, self-cleaning oven and even a dishwasher! The flooring is upgraded carpet and vinyl. The bathroom is roomy and has a tub/shower combo. The bedroom has a bay with built-in cabinetry as well as the double doored closet. A Trex platform deck leads you into the front residential entry door and the back steps are also Trex. The shed is 10’ X 10’ with work bench and washer/dryer. There is an assumable termite contract! Price JUST REDUCED TO $36,000.00 To view, call Steve or Wayne at 520-876-2699 or Steve cell at 520-252-5202 or Wayne cell at 616-690-6929. 1997 CHARIOT EAGLE, Site #327: This home has an Arizona room that is approximately 10’ X 16’ that is very sunny, leading to the utility room that has a stack washer/dryer & laundry sink. The storage shed has work benches and loft storage. The bedroom has lots of storage, the bathroom is larger with a step-side shower/tub combo. The kitchen has a larger refrigerator, a dishwasher, wrap hutch, 2” blinds and more. There is an additional space on the side of the dining room that could be used for many purposes such as an office, etc. Price JUST REDUCED TO $39,950.00 To view, call Steve or Wayne at 520-876-2699 or Steve cell at 520-252-5202 or Wayne cell at 616-690-6929. 1994 CAVCO, Site #349: This home has LOTS of upgrades, including new counter tops, newer water heater & refrigerator. The cabinets are in excellent condition, the bathroom has a tub/shower combo. The laundry room is approx.. 6 ½’ X 11’ with washer and dryer. The AZ room is approx.. 7’ X 13’ with futon. All furnishings included, plus a BBQ grill, 5 patio chairs and even a man’s bicycle!! PRICE JUST REDUCED TO $29,500.00 To view, call Steve or Wayne at 520-876-2699 or Steve cell at 520-252-5202 or Wayne cell at 616-690-6929. 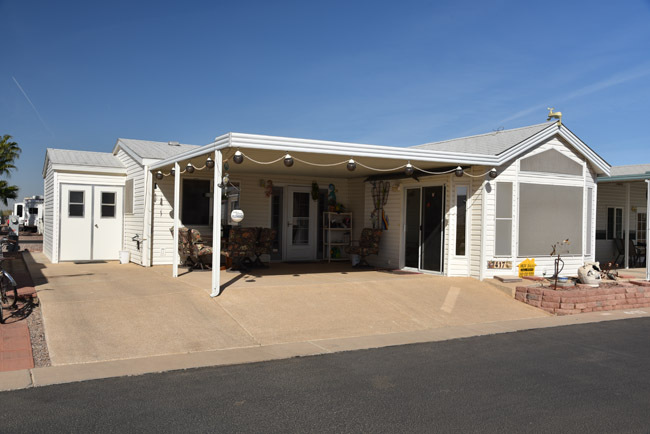 2002 CAVCO SUNBURST, Site #404: This home faces east and if you are a quilter, this home is for you, the 10′ X 12′ insulated & finished shed with ample storage caters to the quilter and is a must see! The Park Model has an elongated open, galley kitchen, built-in microwave, soffit lighting, built-in hutch with etched glass, wooden valences & a hall pantry. The larger bathroom has a tub/shower combination & linen closet, the bedroom has LOTS of cabinet space. All furnishings included! Price JUST REDUCED TO $29,900.00 To view, call Steve or Wayne at 520-876-2699 or Steve cell at 520-252-5202 or Wayne cell at 616-690-6929. 1999 SKYLINE, Site #408: This home has an open “L” front kitchen with bull nose tile and lots of beautiful oak cabinetry! Flat top stove, 2” blinds, laminate flooring, tub/shower combo, and the bedroom has a mirrored door closet, cabinetry as well as an additional closet. The AZ room is approx. 16’ X 16’ with tile floor, a hide-a-bed and oak entertainment center. There is a business area with built-in-desk and a huge closet. The util. room has a stack washer/dryer, refrigerator, work bench and queen sized bed. This unique home has vinyl siding and a side patio sun screen and is fully furnished. Priced at $54,850.00.To view, call Steve or Wayne at 520-876-2699 or Steve cell at 520-252-5202 or Wayne cell at 616-690-6929. 2001 CAVCO, Site #409: This immaculate home has many upgrades, laminate flooring in living room & bedroom, 2″ blinds, tinted windows & new refrigerator. The galley kitchen is very roomy with a hall pantry. The bathroom has a tub/shower combo and linen closet. The bedroom has lots and lots of cabinetry as well as a lift bed for extra storage! The patio has a sunscreen, a 5th wall and back patio pavers. The shed is a 12′ X 12′ insulated and finished unit with washer/dryer and lots more storage. Priced at $34,000.00 To view, call Steve or Wayne at 520-876-2699 or Steve at 520-252-5202 or Wayne at 616-690-6929. SALE PENDING!! 2006 CAVCO, Site #417: This unique home is a GROUND SET (meaning no steps) unit with ceramic tile floor, wooden valences, “U” shaped kitchen with a work station on the adjacent wall with bullnose tile, double door stainless steel refrig. with bottom freezer, hall pantry cabinets with doors on both sides of the hallway. The bathroom is larger with tub/shower combo, the bedroom has lots of cabinetry. The AZ room is approx. 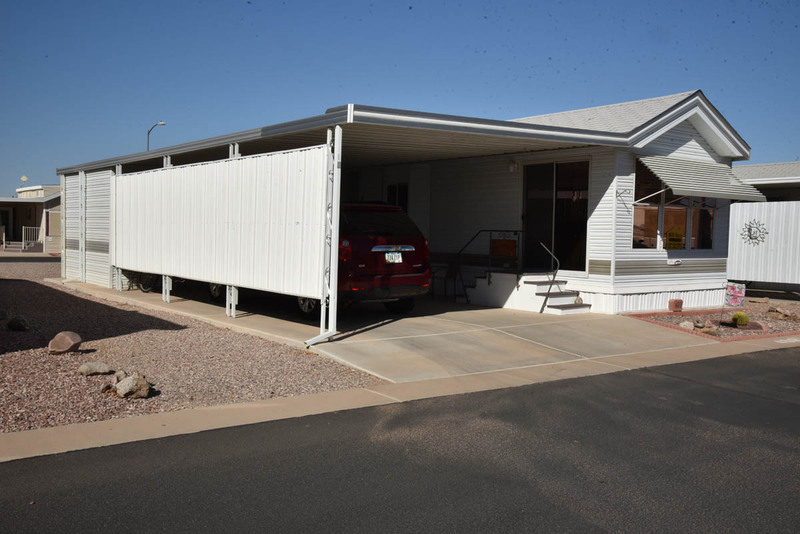 10′ X 15′ with laminate wood flooring, the front door has side lights for ventilation, the laundry room is HUGE and has a washer/dryer, shelving, storage cabinet and 1/2 bath. The storage shed is approx. 6′ X 12′ with double french door entry. There is an epoxy coated patio and additional parking area. some furnishings. Price JUST REDUCED TO $58,000.00 To view, call Steve or Wayne at 520-876-2699 or Steve cell at 520-252-5202 or Wayne cell at 616-690-6929. 1995 CAVCO, Site #512: Located on a large, nicely landscaped lot. The roomy living room has a bay window & electric fireplace. The kitchen has soffit lighting & a flat-top stove, the bath has a corner shower and the bedroom has LOTS of storage space. The shed is approx. 10′ X 12′ carpeted, insulated with washer/dryer, storage cabinet and small refrig. Rear patio pavers make for a nice area to sit and relax. The driveway has a sunscreen and there is a front awning. Furnished and has an assumable termite contract. Priced at $39,900.00 To view, call Steve or Wayne at 520-876-2699 or Steve cell at 520-252-5202 or Wayne cell at 616-690-6929. SALE PENDING….2005 CAVCO, Site #525: This unique home has an eat-in kitchen, flat top stove, laminate flooring, newly painted interior, hallway storage, a larger bathroom with walk-in shower & bathroom linen closet. The bedroom has lots of cabinetry. The Arizona room has burber carpet and the larger utility room has a washer & dryer and storage shelving located behind bi-fold doors. The back door exits onto patio pavers and a nice “sitting area” and then on to the storage shed that is approx. 8′ X 10′ with work bench and lots of storage. The front deck has under storage and ceramic tile decking. The exterior has all new sun screens as well as roll down screens, all located on a large lot! Some furnishings included. Priced at $56,900.00 To view, call Steve or Wayne at 520-876-2699, Steve cell at 520-252-5202 or Wayne cell at 616-690-6929. 2007 CAVCO, Site #648: This home has a carousel kitchen with beautiful cabinetry and lots of storage, a garbage disposal, R.O. system, side by side refrigerator & flat top stove. The bathroom has a tub/shower combo and the bedroom has a bay with lots of storage space. The AZ room has a spacious living room (approx. 11′ X 18′) with laminate flooring. There is a large utility room with washer/dryer plus many more extras. Patio pavers lead to a separate, finished storage shed. The outside of the home includes a large patio area with privacy screens. Price JUST REDUCED TO $55,900.00 To view, call Steve or Wayne at 520-876-2699 or Steve cell at 520-252-5202 or Wayne cell at 616-690-6929. 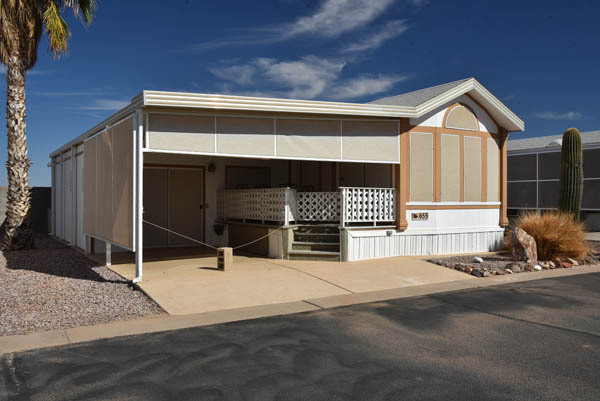 2001 FLEETWOOD, Site #655: This beautiful home has an AZ room that is approx, 16′ X 12′ with new carpet, southwestern stained glass windows add to the charm of this home as well as the Atrium doors with build-in blinds. A larger laundry room with washer/dryer, work bench with lots of storage, a u-shaped kitchen with additional work counter, dishwasher, larger bathroom with tub/shower and handicap bars, a high rise toilet, a built-in hall desk and lot of storage and cabinetry in the bedroom with 2″ blinds throughout. The bedroom has new carpet and lots of storage. This energy efficient home has tinted windows, sunscreens, a back patio area with patio pavers, a rear overhead awning, a 3 ton air conditioner w/heat strips, new water heater and circuit breakers. The driveway has epoxy coating and a carport screen and the deck has underneath storage. Priced at $55,900.00 To view, call Steve or Wayne at 520-876-2699 or Steve cell at 520-252-5202 or Wayne cell at 616-690-6929. .2002 CAVCO, Site #659, This home is a real beauty. This unique home has an “L” shaped deck with sitting area of approx. 31’ X 8’, the laundry area is at the back of the deck and has a built-in desk center with overhead cabinets. The private back patio has patio pavers and an overhead awning. The Park Model has a galley kitchen, flat top stove and water filtration system, the bathroom has a shower/tub combo. FURNISHINGS INCLUDED. Price just reduced to $43,900.00 To view, call Steve or Wayne at 520-876-2699 or Steve cell at 520-252-5202 or Wayne cell at 616-690-6929.